Shade trees not only enhance your landscape's appearance--they also potentially add value to the property, qualifying as a longstanding investment. The climate of Missouri is continental, with temperatures reaching 90 degrees in the summer and below freezing in the winter, but extreme temperatures of any sort for long periods is rare. Missouri includes USDA Hardiness Zones 5a, 5b, 6a and 6b from north to south. Missouri shade trees come in three sizes: large, medium and small. Select only the healthiest trees to grow for your location, according to the size of the mature shade tree that you need. Large Missouri shade trees grow to heights of over 60 feet tall when fully mature. Planning is vital when planting trees in this category to ensure enough space is provided for the full-grown size. Do not plant these trees under wires, other trees or additional overhead obstacles and not near driveways, sidewalks or any buildings. The branches and root systems of these trees require large areas for full development. The spread of large shade trees can be as wide as it is tall, such as the bur oak, which can reach heights and spreads up to 80 feet. Large shade trees for Missouri include the following: American sycamore (plane tree), bald cypress, bur oak, English oak, green ash, honey locust, horse chestnut, Norway maple, pin oak, red maple, red oak, scarlet oak, Siberian elm, silver maple, sugar maple, swamp white oak, sweet gum, tulip tree, white ash and white oak. Missouri shade trees classified as medium-sized will reach mature heights between 30 and 60 feet. Provide a healthy environment of well-draining soil and full sunlight for your shade tree. Plan enough growing room for the tree you choose to fully mature, such as 35 feet wide and 50 feet high for a ginkgo or 40 feet wide and 60 feet high for a linden. Shade trees to grow in Missouri landscapes considered medium consist of these species: black gum, ginkgo, Japanese pagoda tree, linden, river birch and yellowwood. Always deal with a reliable supplier when purchasing shade trees, such as your local garden center or regional nursery. Most of the shade trees purchased locally are suited for Missouri conditions. 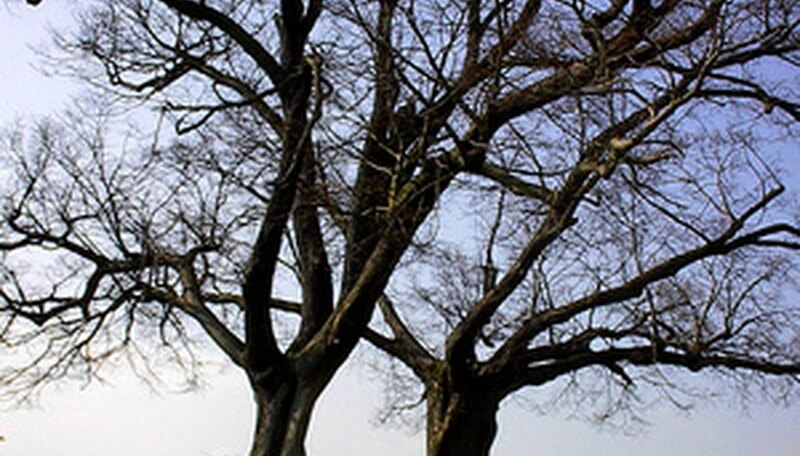 Small Missouri shade trees reach heights of no more than 30 feet. Trees in this group include two that grow to a mature height of 20 feet, the amur maple and the golden-rain tree, plus the Trident maple, which reaches 30 feet when fully grown. The Amur maple features red foliage in the fall and survives in most soil types. The golden-rain tree produces big yellow blossoms in groups at the end of June and the Trident features leaves that change color from spring to fall.